AN AREA OF 650,000 SQUARE MILES, inhabited by some 200,000,000 people, is drained by the Yangtze Kiang. It is estimated that the river basin absorbs sixty per cent of the country’s foreign trade. The range of steam and power navigation on the river can be divided into three stages: the first to Hankow for big vessels, the second to Ichang for smaller ships, and the third to Chungking. There is also some traffic as far as Suifu, about 1,600 miles from the sea. The river has a total length of about 3,200 miles. CHINA’S greatest inland waterway, the Yangtze Kiang, ranks as one of the world’s main arteries of transport and communication. In the same way as the Nile, the Yangtze brought fertility, and was used as a highway for many centuries before the West emerged from the darkness of barbarism. But there the resemblance ends. The difference between the two is as marked as that between a dahabiyeh (Nile passenger boat) and a junk, which, in the opinion of many, is one of the most efficient sailing vessels ever evolved. Yangtze river craft had water-tight compartments long before the naval architects of the West thought of the idea; the heavy toll of the turbulent river taught the ingenious Chinese the value of the device. The rise and fall of the river in the lower reaches and above the great gorges are remarkable. Every passage up and down the river is a new adventure, so rapid are the changes in the navigable channels. Power has altered some things, but the Yangtze is untamed. Ocean-going vessels in the summer go up as far as Hankow, nearly 600 miles from the sea. At Hankow the Yangtze is about a mile wide. When the river is high, large warships also can easily reach this river port. Steam and power navigation on the river fall into three stages. The first stage is to Hankow, for large vessels of over 10,000 tons; the second stage is to Ichang, for smaller vessels ; and the third stage is to Chungking, this last including the passage of the rapids. There is a further extension to Suifu, but power traffic on this section is not heavy. Suifu is about 1,600 miles from the sea, and the river is thus navigable for nearly half its total length of some 3,200 miles. Small boats and rafts use the river above Suifu, and power craft from that distant port go up a tributary of the river from Suifu to Kiating. The area drained by the Yangtze is about 650,000 square miles and is inhabited by about 200,000,000 people. It is estimated that the river basin absorbs sixty per cent of the foreign trade of the country. Near the mouth of the river is the world-famous port of Shanghai, which is not on the Yangtze itself, but about fourteen miles up the Whangpoo, a river flowing into the Yangtze estuary. The delta region is intersected by creeks, canals and lakes, which support a vast floating population. Thousands of Chinese people live in sampans and junks under incredibly crowded conditions. The river silt is adding to the coast-line round Shanghai, which is gaining on the sea. All the coasts and inland waterways of China are buoyed and lighted by the Chinese Maritime Customs Marine Department, a remarkable organization. A large proportion of the power traffic on the Yangtze is operated by British and other non-Chinese companies, and foreign warships go to the limit of navigation. It may seem strange that foreign warships should protect their nationals more than 1,000 miles from the sea, but the peculiar history of modern China must be borne in mind. In the middle of last century a rebellion, which took ten years to suppress, broke out in China. This rebellion and its consequences had much to do with the beginning of the Customs service and the growth of steam traffic on the Yangtze. There were no great highways and the river was the only means of through traffic with the interior. The rebels captured the native city at Shanghai, and the Custom House established under a treaty was closed. But the British and American consuls made their nationals continue to declare imports and pay dues, and the Chinese officials who had taken refuge in the foreign settlements agreed to put the Shanghai Customs Office under foreign control, the British, French and American consuls each nominating an inspector. The Chinese Maritime Customs Service was started in 1854. In 1863 Mr. Robert, afterwards Sir Robert, Hart became Inspector-General. The Service has expanded enormously, the employees now numbering about 11,000 men and women. At present the central control is at Shanghai, but it will eventually be at Nanking, the capital of the republic. ONE OF THE MOST EFFICIENT SAILING VESSELS ever designed is the Chinese junk, the design of which has been unaltered for centuries. Generally it has a high stern, and matting sails. This type of flat-bottomed craft persists on the Yangtze Kiang, as in other Chinese waters, and the junks form the floating homes of many thousands of Chinese people. A junk is also illustrated on the cover of Part 39. Most mariners would prefer the hazards of the ocean to service in a Yangtze river steamer; but the river men remain at their posts. In addition to the extraordinary difficulties of navigation, they risk being shot or kidnapped by pirates and held to ransom. Sometimes vessels have been seized by local war-lords and generals, and the officers compelled to obey orders without regard to such points as overloading with troops and the risk of capsizing. “Pidgin” cargo is another annoyance. “Pidgin”cargo - and there were “pidgin” passengers also - is a term meaning non-paying cargo that includes smuggled opium. The system of armed guards has partly checked the practice, which was formerly rife at upriver ports. Unsupported by armed guards, no officer could prevent it, and if he had tried he would have had to fight for his life openly or risk being the victim of an unaccountable “accident”. One new officer, the only white man in an up-river steamer, who had considerable ocean experience, put his foot down on his first trip. He was chased all over the ship, but saved his life by his agility, and finally got under way when he had “accepted” the “custom”. There are many troubles at sea, but there are more on the Yangtze. Even with armed guards and rigid inspection of every vessel on reaching and before leaving port, it has not yet been possible to stop opium smuggling. Waterproof bundles containing the drug are thrown overboard as the steamer nears a port, and the bundles are picked up by sampans and junks which are hovering about. Despite abnormal difficulties of navigation, regular services are run from Shanghai to Yangtze river ports by companies of Chinese, British, Japanese, American and other nationalities. There are two periods of high water in the Yangtze; in June when the rainfall from the lower mountains increases the level, and in August when the water from the melted snow and ice of the high mountains of West China and Tibet increases the volume. The current then increases in pace. Old islands are swept away and new ones built up with the silt carried down. In the high water season the pilots have a difficult task watching the daily changes in the channels. In the low water season the current becomes so slack that steamers swing to the ocean tide at Nanking, 200 miles from the sea. The fact that there are two large lakes, Poyang and Tungting, opening into the river between Ichang and the sea is a great advantage. These lakes receive a large part of the flood waters in the high season and allow this water to descend to the ocean more gradually than if the natural reservoirs did not exist. On the lower section of navigation the three ports Shanghai, Nanking and Hankow are the most famous, though Shanghai itself - as already explained - is not on the river, but on a tributary. At one time all three were under martial law. Nanking is the capital of the Chinese republic, and Hankow is one of the great cities of China. Bound for Hankow, a vessel proceeds down the Whangpoo from Shanghai for some fourteen miles to Woosung, where the Whangpoo reaches the great estuary of the Yangtze. From Woosung to Hankow the distance is some 576 nautical miles. 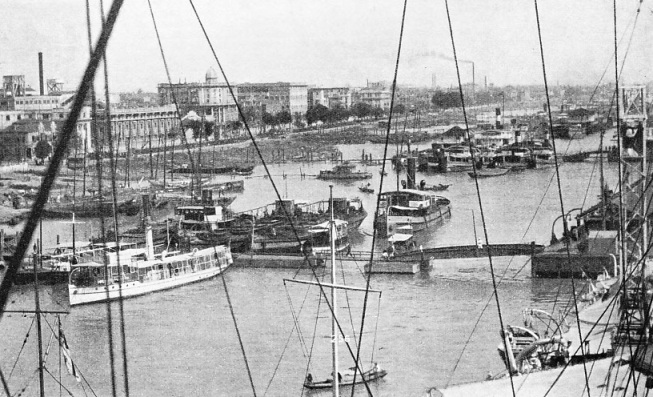 A VIEW OF THE HARBOUR of Hankow, on the Yangtze Kiang, is seen here. Hankow, one of China’s greatest trade centres, is nearly 603 miles from the sea. Ocean-going vessels of over 10,000 tons can normally reach the port during the summer. The river here is about a mile wide, and when the water is high even large warships can come up to Hankow. In flood times the river at this point can rise as much as 50 feet. The amount of silt brought down by the river is enormous. Although one of the most powerful dredgers in the world is employed to keep the channel clear, it is estimated that in two days the river will, at certain times, bring down enough silt to keep this dredger employed night and day for one year. The currents cut sections out of the mud in the manner of a hot knife going through butter. Recently, in two hours 300 feet of bank was eroded and a beacon fell over into the river; light-keepers, ever on the alert, salved it before it was swept away. Numerous islands are formed by the silt, and the lightships and beacons are constantly being shifted. Mariners 100 miles off shore know that they are near the mouth of the Yangtze because even there the sea is turned a dirty yellow by the river. Vine Point, forty-nine nautical miles up the estuary, is the limit of the Shanghai Customs District, after which the vessel enters the Chinkiang District; this extends to Nanking, 144 nautical miles above Vine Point. This stretch can be extremely dangerous in bad weather. On one occasion a vessel was blown offher course during a storm, her propeller hit a bank and the blades were stripped off. She wirelessed to Shanghai and was towed to safety. 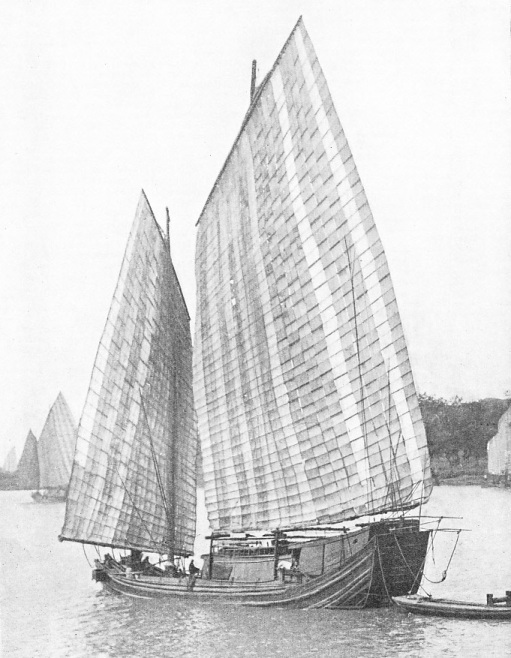 Ocean vessels of all maritime nations go up to Hankow, and, in addition to the river steamers, there is a vast traffic of junks and other smaller craft. At Chinkiang, forty-seven nautical miles below Nanking, there are innumerable small creeks which are used by small craft. Near here, the Grand Canal enters the Yangtze. For centuries hydraulic engineering has been practised in China, and the Grand Canal dates in part from the sixth or fifth century. It was built between Tientsin and Hangchow, but most of its length has long since been derelict, and it is not much used now except by launches and junks. the Yangtze overflows its banks night navigation is suspended; at times of low-water there is barely sufficient water in the channels to float vessels. At all times, therefore, constant anxiety prevails. Ocean vessels bound for Hankow are generally piloted by foreign pilots, but the pilots of the regular river steamer lines are now exclusively Chinese. Up-stream above Wuhu is the Kiukiang Customs District. Navigation here depends upon the weather; in some years the banks are not flooded, even in the middle of the high season, but there is not enough water in the low season to float the largest ships. In this particular district channels were sounded daily, and sometimes twice daily, in the low season of 1934, and it was difficult to notify ships of every change. One vessel grounded and blocked a channel, but traffic was diverted to another channel. No fewer than fourteen light stations were raided by pirates, who, however, left the lights intact. Hankow is one of China’s greatest centres of trade, sea, river and railway traffic. It lies on the north bank of the Yangtze, opposite Wuchang, and marks the limit of a number of river routes. Up to the time of writing, the largest merchant vessel to reach the port is the American tanker Australia, of 11,628 gross tonnage. Despite various troubles the Chinese have persevered in building up the banks of the river; but for this Hankow would have been badly damaged when the river threatened the city in 1935. Hankow is the headquarters of the Lower and Middle Yangtze Customs Administration. The Han Kiang or Han River, which here flows into the Yangtze, provides a means of communication with the country to the north-west, a large amount of cargo being carried in junks. The middle section of the Yangtze, from Hankow to Ichang, 383 nautical miles, is connected with a vast network of waterways. At the port of Singti, 101 nautical miles above Hankow, the river is divided by an obstruction into two channels, Singti East and Singti West, the town being on the latter. The Singti West Channel dried out at one end in 1934, and, as the only outlet for the water was through the East Channel, the silt formed a mud bar in this channel, causing vessels to ground. IN THE ICHANG GORGE on the Yangtze Kiang. A stern-wheel steamer built for navigating in shallow and difficult waters. This gorge is not far from Ichang, 383 nautical miles from Hankow. Ichang was for long the limit of steam navigation from the sea. 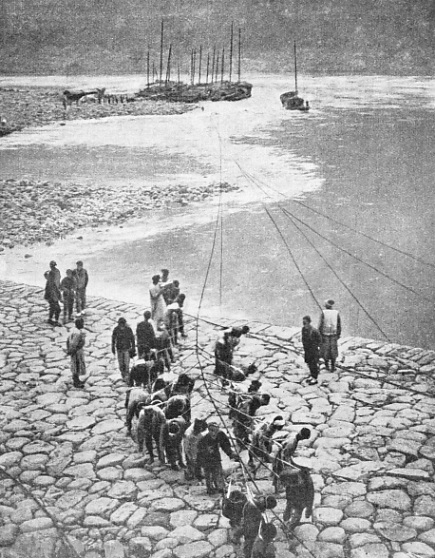 In 1934 the average draught of ships trading up to Ichang was between 7 feet and 10 feet. One of the most difficult and dangerous sections of the river is above Ichang up to Chungking. Chengling, on the south bank, is the harbour for the important port of Yochow, five miles up the Siang River and close to Lake Tungting. Yochow is the centre of a network of creek, river and lake routes leading to many towns. Lake Tungting is of considerable extent, and east and west routes lead across it to its affluents. One of the most important river ports in this region is Changsha, up the River Siang. About nine nautical miles below Ichang the river passes through the first great gorge, the Tiger’s Teeth, which is about 900 yards wide and about two miles long. Ichang was for long the limit of steam navigation from the sea. Above it the reach of the river resembles a mountain loch with no outlet, until the vessel has proceeded far enough for the majestic Ichang Gorge to be seen. In 1934 the average draught of vessels trading up to Ichang was between seven and ten feet, the largest vessel to enter the harbour being the British steamship Pingwo, of 3,105 gross tonnage. Above Ichang is the Upper Yangtze District, which extends to Chungking, with an extension to Suifu and Kiating. The section between Ichang and Chungking - over 400 miles long - is one of the most difficult stretches of river navigation in the world. Every trip is a hazard, yet in 1934 sixty-six vessels, including four Chinese gunboats and twenty-two foreign gunboats, made at least one single trip. Sixteen of the forty merchant power vessels were Chinese, ten were British, seven American, three Italian, two French and two Japanese. is said to be navigable for crooked stern junks to Kungtan, a distance of about 200 miles. Chungking, the end of this section, is important. The harbour has no buoys, and vessels make fast to wood or iron pontoons, which are spar-moored and anchored off the banks of the river where possible. The pontoons belong to the shipping companies who rent the foreshore sites. Here the river rises 100 feet in the high-water season. 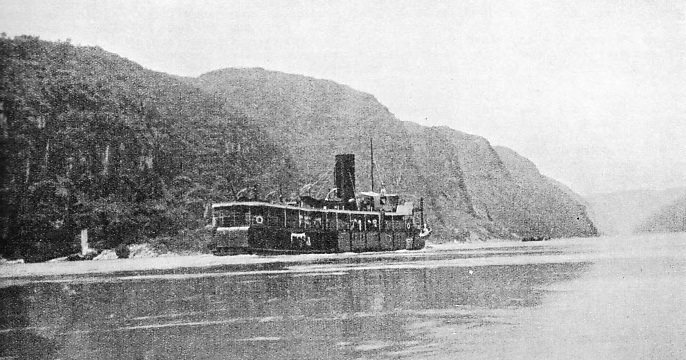 The largest vessel to enter and leave Chungking in 1934 was the British steamship Kiawo, of 1,311 gross tonnage. Chungking lies at the confluence of the Kialing River with the Yangtze, and steam and motor vessels go up the Kialing to Hochow, a distance of fifty-two miles. Up the Yangtze from Chungking, vessels proceed to Luchow, 135 miles away , and on to Suifu, sixty-six miles farther. At Suifu the Min River flows into the Yangtze, and power vessels go up the Min to Kiating, eighty-seven miles, in the high-water season from June to November. The total distance from Chungking to Kiating is 288 nautical miles. Suifu is the limit on the Yangtze for regular services of power craft in the season, but trade above it is continued by Chinese river boats and rafts. The section between Ichang and Chungking for long baffled the pioneers of steam. As many as 200 men toiled to tow one laden junk against a current up to eleven knots. The trackers, as these human tow-horses are called, had in places to hang on by fingers and toes where the track was cut out of the side of a gorge. Their urge was the lash. Steam is now often used instead. Two British pioneers were Mr. Archibald Little and Captain C. S. Plant. Mr. Little brought the steamer Ruling, 304 tons, to Ichang in 1888, but the Chinese opposed the project, and the Chinese Government bought the vessel. Mr. Little persevered, however, and made the first trip in a seven-tons launch in 1898. This launch, the Lee Chuan, proved that the trip was possible. The first merchant vessel to go from Ichang to Chungking under her own power, unaided by trackers, was Captain Plant’s Pioneer, of 331 tons. She made the trip in 1900. She was sold to the British, and converted to a gunboat. The real conquest of the rapids dates from October, 1909, when the indomitable Captain Plant’s steamship Shuting made the trip from Ichang to Chungking in eight days, compared with the twenty-five to thirty days taken by light junks tracked through the rapids. MAN-POWER for hauling vessels is still extensively used on the Yangtze Kiang. The haulers are known as “trackers”, and above are some of them hauling boats over the Yeh-Tan rapids. On occasions as many as 200 men have toiled to haul a heavily-laden junk. The rapids are caused by great rocks falling from the steep sides of the gorges, and the danger varies according to the level of the river. You can read more on “Gunboat Patrols in China” and the “Kung Wo” on this website.